How does cooking and relationships go together you might ask? Well it’s a bit like salt & pepper, champagne and strawberries or even a knife and fork! Cooking together can definitely spark excitement in the kitchen; working with each other to follow a new recipe, tasting as you go, creating delicious new flavour combinations. No need to remember to make reservations, shout over the loud music or strain to see your food in the dim lighting. You can turn your home into the hottest and coziest new restaurant and even keep your slippers on! Cooking together allows couples to connect and communicate in different ways, and as we say in our motto you can Inspire, Discover, Enjoy! Join us this Valentine’s Day to learn to cook the most romantic beautiful Italian meal, here at The Cooking Academy for our Valentines inspired Italian Masterclass Evening event. Not only will you learn how to cook a delicious meal together, but you will learn new culinary terms and techniques. Unsure what Al dente is? Sick of soggy sauces? Maybe your partner knows the answer, maybe not! You can both learn together from an expert Chef! Communication is as key as it is in cooking as it is in love, arguments can simmer and efforts can feel wasted. But we’ll show you how to smooth things over with the perfect sauce recipe and discover the perfect pomodoro or arrabbiata for some added spice! When you’ve finished getting down and dirty with the past making lesson You can sit down and enjoy your hard work and appreciate the joint effort that went into your delicious meal. 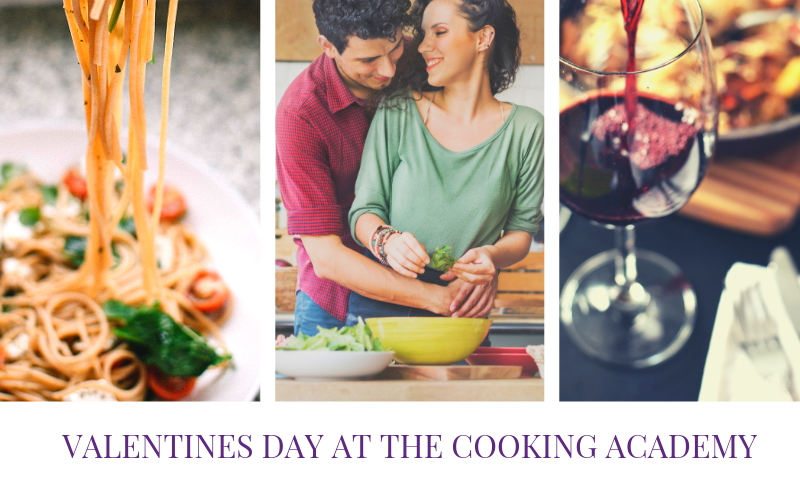 Join The Cooking Academy on Valentine’s Day for a fun filled evening, learning to cook the food of love! 6:30pm-9pm. An Italian Masterclass to get stuck into with your other half. Enjoy delicious hand-made pasta and sauces all made from scratch and a glass of wine or two! Only room for 4 couples so hurry and BOOK NOW! 1 Ticket admits 2 people and are only £149. Contact katherine@thecookingacemy.co.uk or call 01923 778880 to Book your space.